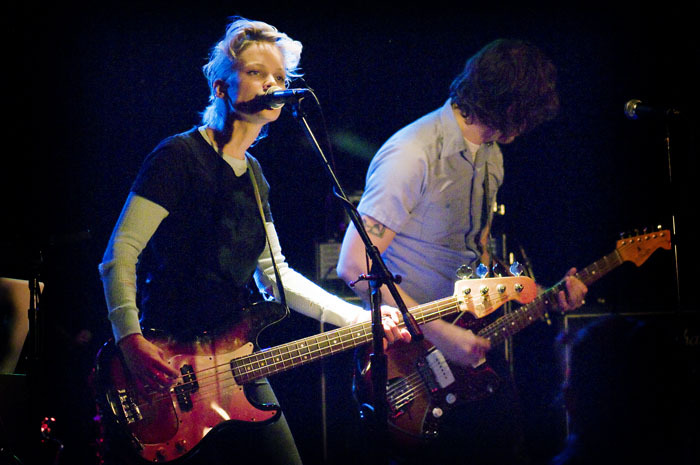 Conway performs with previus band All Wrong and the Plans Change at The Viper Room in 2009. After making waves at last week's CMJ Festival in New York and making one of Rolling Stone's top 10 Best New Discoveries, LA-based Conway returns home to play The Echo where she'll open up for NONONO and then at Bardot's on Monday as she continues her West Coast tour through Portland, Seattle and then back here where she'll play The Fonda Theater on November 12th. Born in south St. Louis, born again in Brooklyn and currently coming into her own in LA, Conway (aka: Kassia Conway) is known for her gloomy, pop arrangements when she fronted her previous bands All Wrong and the Plans Change and No Love Letters. Now she's going solo with the release of her debut EP Big Talk, released last month via Columbia Records. Her first single "Big Talk" is fanned with funk bass and guitars that's propelled by hip-grooving beats and a contagious melody and chorus while "Killer" splashes with dream-pop harmonies highlighted by Conway's restrained but forceful vocals. In "Take Me Back" she strips down minimal arrangements with soft drums and delicate keys, echoing back to her simmering and longing tunes from her past bands.